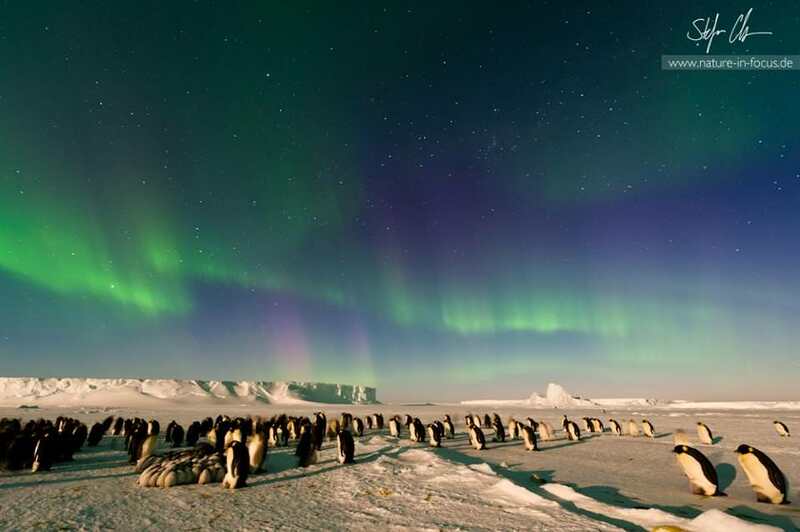 Emperor Penguins on the Antarctic Sea Ice Under the Aurora Australis. Credit and copyright: Stefan Christmann. Used by permission. Photographer Stefan Christmann called this incredible Antarctic view a once in a lifetime experience. “It was the most impressive experience to sit on the sea-ice and watch the Aurora Australis dance above the penguin colony with the sounds of the chicks and the adult penguins. I feel truly blessed for having had the opportunity to witness this once in a lifetime experience,” he told Universe Today. Christmann is currently based in Antarctica, working at the German Antarctic research station Neumayer III. He is an “overwinterer” — scientific and technical staff who stay at the base for the entire southern winter — and will stay in Antarctica for an uninterrupted 14 months. “As a physicist, my duty is to maintain the data acquisition of our seismological and geomagnetic observatories as well as the analysis of the collected data,” Christmann said. But he is also an accomplished photographer. His website and Facebook page are filled with beautiful nature images from around the world, and recently feature the Emperor penguins and their adorable chicks, as well as the stark beauty of the Antarctic landscape. Originally from Germany, he studied photography in the US, and his work has now brought him to an extended stay in Antarctica. Christmann explained the conditions and the difficulties in obtaining this shot, one he had long hoped for, the planning of it always in the back of his mind. And time was short, as after he had been outside for a few hours the wind picked up and he and his accomplices had to leave the ice for safety reasons. “Otherwise we probably would have sat there all night!” Christmann said. The image was taken on October 1, 2012. Christmann shared what equipment he uses as well as a few tips for Antarctic and cold weather photography. To see more of Christmann’s work visit his website, Nature in Focus or his Facebook page, where he shares many pictures of his Antarctic adventure. Please note: This image may not be re-posted, used or copied without the express permission of Stefan Christmann.